Home > Affiliate Valuation: How Much is My Affiliate Business Worth? 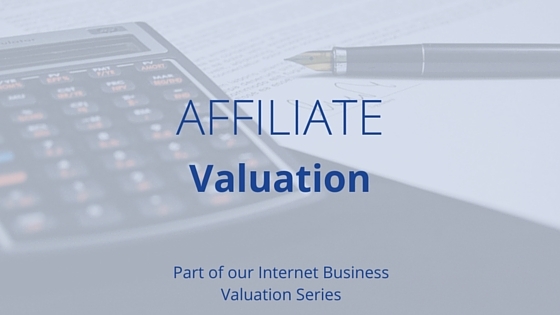 Affiliate Valuation: How Much is My Affiliate Business Worth? Affiliate websites are popular business models among online business owners, and for good reason. They’re relatively easy to get started, and, when done properly, can be very profitable. The nature of the affiliate program will likely have an impact on the valuation. Any business that has been built to promote a single affiliate product is at risk of losing revenue because there is a chance that the product will change, go away or simply lose appeal with customers. This has been demonstrated well by Amazon in recent years. Being too reliant on a single revenue source is always risky. Conversely, if an affiliate business is promoting multiple offers and the revenues are well diversified, the business will likely receive a higher valuation. Is the business growing or shrinking? How evergreen are the products being promoted? How large and established is the affiliate partner (i.e. 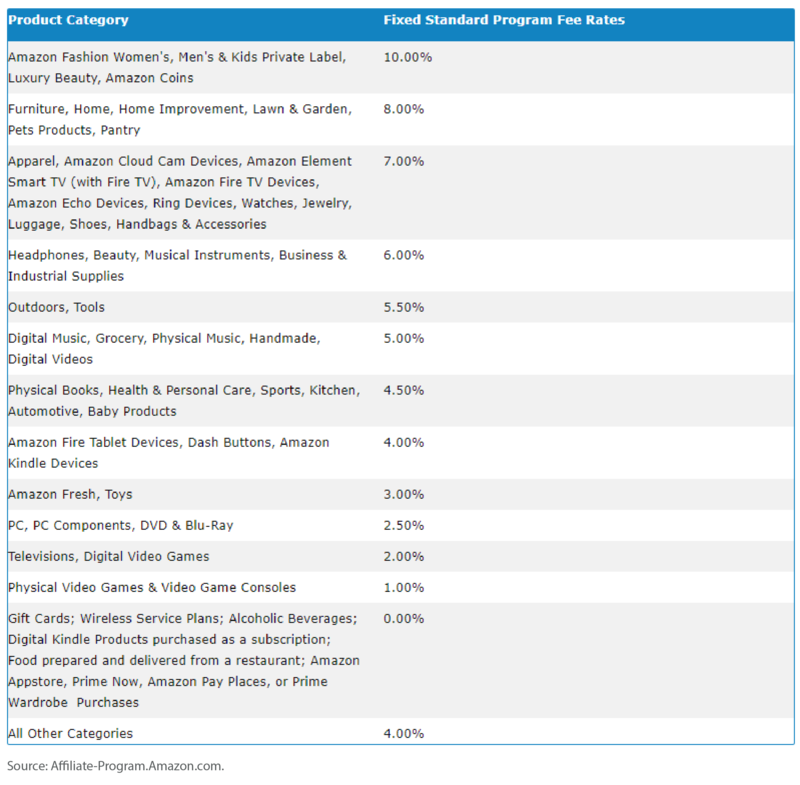 Amazon is a large incumbent player in e-commerce so has a lower perceived risk of failure)? How long has the business been a part of the affiliate program? Can the terms of agreement be transferred over to a new owner? Will the new owner have to negotiate on their own? The more sustainable and reliable the affiliate program is, the higher the valuation multiple is likely to be. As with any business, the niche plays a big part in the attractiveness of the opportunity for a buyer. You’ll want to examine product trends, seasonality and the overall staying power of your affiliate products. Generally, evergreen niches will be valued higher than trending niches, even if the latter seems more appealing upfront. For example, healthcare products like diapers will always be in demand. Therefore, an investor will assign a premium valuation to an evergreen product that will remain profitable, and where there may even be room for additional long-term growth. On the other hand, if the program is selling a trendy product like fidgetspinners, an investor would be right to question the sustainability of the business. It could be that fidgetspinners are here to stay, but this is hard to predict given the age of the niche and the demographic of the target customer (trends tend to burn brighter and faster with younger audiences). Seasonal businesses can be very profitable and even considered evergreen if they’re something customers will demand year over year. However, seasonality definitely plays a part in how you need to present your financials for valuation. Let’s use electric fireplaces as an example. You’re likely to see higher sales in the fall and winter, and numbers will naturally be low in the spring and summer. If this business generates $5,000 per month October through March, but just $500 per month the remainder of the year, it wouldn’t make sense to base a valuation on the financials from your high-income months. Instead, you would present your average monthly income for the year, which in this case would be $2,750. The same is true for Christmas or Black Friday, which tend to be lucrative seasons for affiliate sites. This means there may be considerable spikes in commissions and revenue that should be averaged into year-round revenue. Depending on the affiliate program, there may be commission tiers that are tied to the volume of sales through the affiliate account. While not volume-driven, the most well-known affiliate program is Amazon’s affiliate program, where the commission rates range based on category (this used to be on sale volumes, which Amazon changed over time). Affiliates can also earn commission via Bounty Events and the Trade-In Program (in the United States). To see a full list of Amazon’s commission rates, visit their Fees Schedule here. There are many examples of variable commission tiers across affiliate partners and it is not uncommon for business owners to agree custom rates with larger partners. This can provide above-average concentration and transfer risk to a new owner. Please refer to our article on Amazon FBA Policies to see March 2019’s changes to European commission rates. Affiliate sites usually target keywords with high buyer intent (i.e. “best espresso machines” or “top 10 espresso machines,” which heavily indicate that a user is looking to buy an espresso machine). Because of this, some affiliate sites rely on SEO tactics that fall afoul of Google’s policies, and Google regularly updates its algorithms to ensure these sites are short-lived. If the link profile is heavily anchored around one or two high buyer intent terms, it could pose a risk. The image below shows what a natural backlink profile looks like in terms of anchor text. Notice that the bulk of the anchor text is the name of the website—this is a good indicator of the site gaining natural backlinks and not trying to manipulate Google rankings. Affiliate sites that are built on private blog networks or purchased backlinks are worth less than those with natural link profiles. Sites that use PBNs or purchased links to generate search engine rankings also generally will have less history than their natural counterparts at the same income level. A combination of short history and high penalty risk can have a large effect on the valuation of an affiliate website. High-quality, long form content is the most effective way to rank for relevant search terms and for turning readers into buyers, both of which are very important to the success of an affiliate website. One of the best ways to determine the quality of the content is to see if people are engaged with posts or product reviews. Affiliate sites with hundreds of long-form articles are more likely to rank and as such this creates a defensive moat that is highly prized by investors. 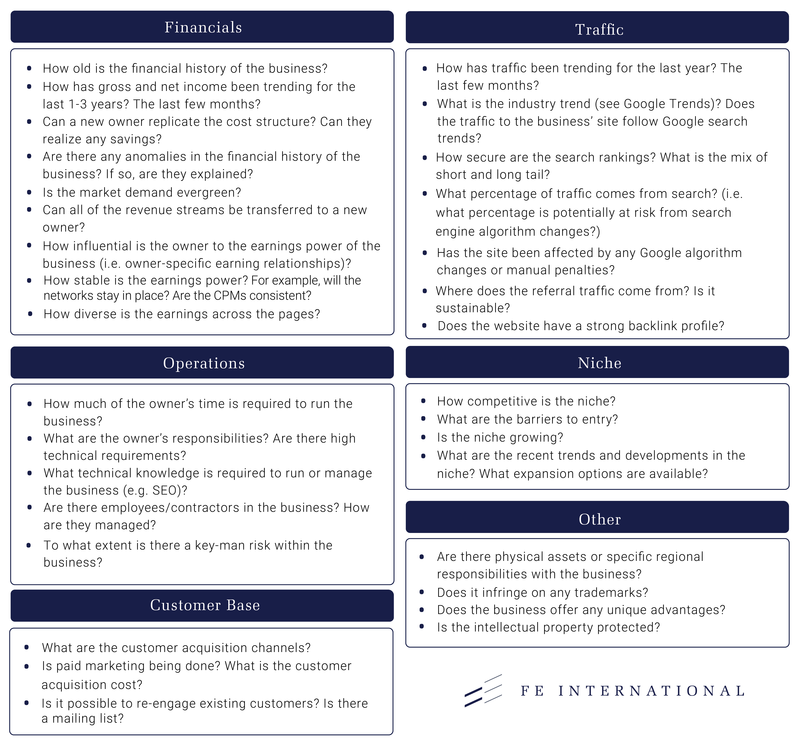 While other websites may come along and disrupt the search engine rankings for short periods of time (through inorganic links), Google is continuously investing time and resource into rewarding content that is in line with its vision, and these well-built sites will prevail in the long term—a factor that is key for investors and reflected through higher multiples. You’ll want to assess the quality of your site’s content by your own subjective measures, but you may also hire an editor or freelance SEO consultant for a second opinion. If you’ve been outsourcing your content creation, you should consider using a tool such as Copyscape to confirm that there aren’t any duplicate content issues. For most affiliate sites, organic traffic is the main source of customers. This means that the more sustainable and consistent the organic traffic is, the better. 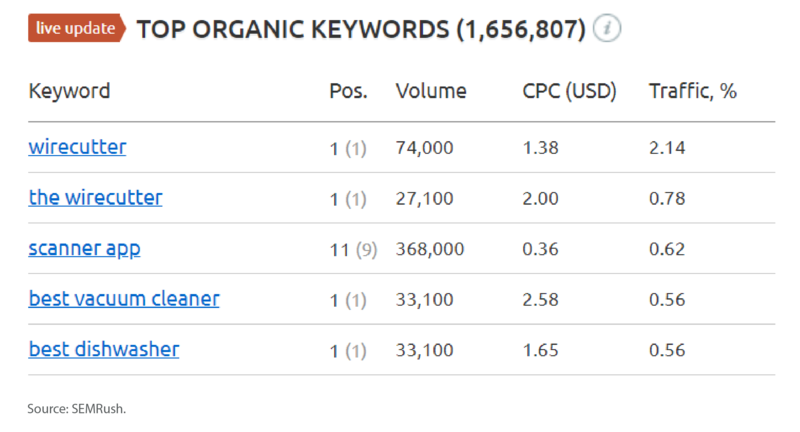 Tools like Google Webmaster Tools, SEMrush and Ahrefs are invaluable in assessing keyword strength and can help shape the opportunities and upside to investors by demonstrating areas of relative strength, as well as areas of improvement to gain additional upside. 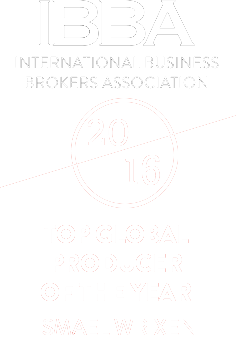 An important factor considered in valuations is diversity of keyword rankings. Similar to platform risk, this reduces the reliance on any one key term which if lost would be detrimental to the earnings potential of the affiliate site. 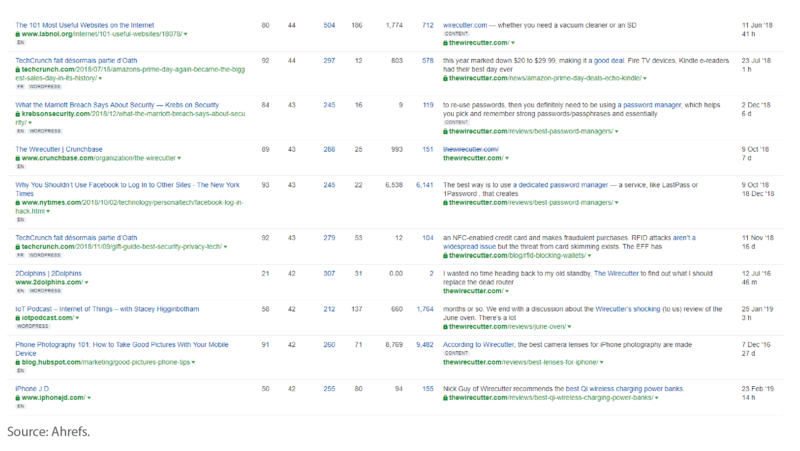 The image above shows that the highest-ranking keyword brings in just over 2% of the traffic. This is desirable in terms of diversification. If a single keyword accounts for more than 50% of the traffic, the affiliate website may be at risk longer term and the valuation will suffer. Diversified traffic sources demonstrate that an affiliate website has desirable content which is well-received by end-users (and industry peers) and often linked to. This leads to higher valuations. The next way to look at the organic health of your site is to view the diversification of organic traffic by the page. 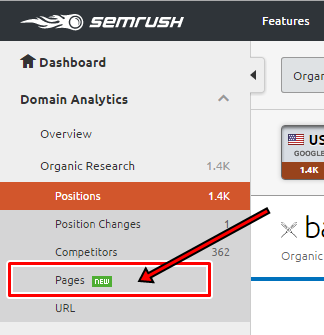 This is found by going to the “Pages” section in SEMrush. Within the “Pages” section you can view the pages that account for the most traffic to the site. Once again, the more diverse the traffic amongst the pages, the better. The top page drives over 21 percent of the total organic traffic, which is not bad. Try to avoid having pages that account for more than 50 percent of the total organic traffic. Relying on a handful of keywords or one page to drive the bulk of the traffic is not smart. If for some reason those keywords or pages were removed, the site would become practically worthless. In this article, we mainly focused on highlighting the different valuation factors that were unique specifically for the affiliate business model. 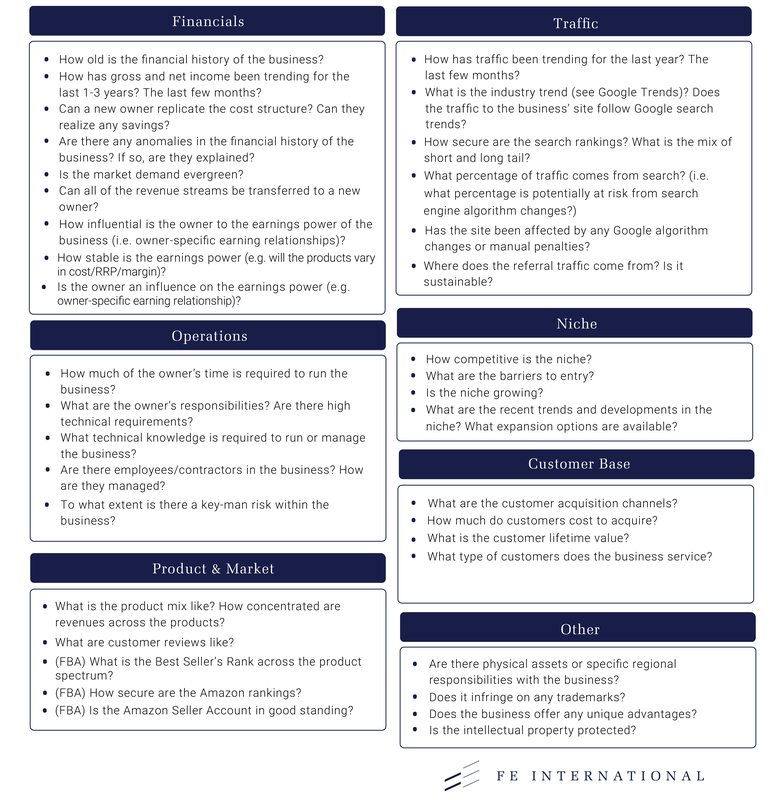 Below you can view a checklist that contains all of the valuation drivers that we consider when valuing an online business. You should use the valuation drivers below in addition to the ones that we highlighted throughout this article. In summary, the valuation of an affiliate website is highly contingent on the terms of the affiliate program and its longevity, the product category, the seasonality of the product, commission tiers, content quality, and the backlink profile. Affiliate websites that can score well in all of these areas will likely have above-average earnings, margins and longevity which proves attractive to investors. Obtaining an accurate valuation can both ensure that you maximize your profit and are able to sell your business in a timely manner. what is the multiple span you saw for affiliate sites in LTM in the industry? The majority of affiliate sites sell in the 2x-3x LTM range. Of course there are outliers on both sides, but that is generally a pretty good rule. Hi Chris how do you value affiliate networks?